Okay, we’ll start with the boring part first, I said, as four of us entered the garden. 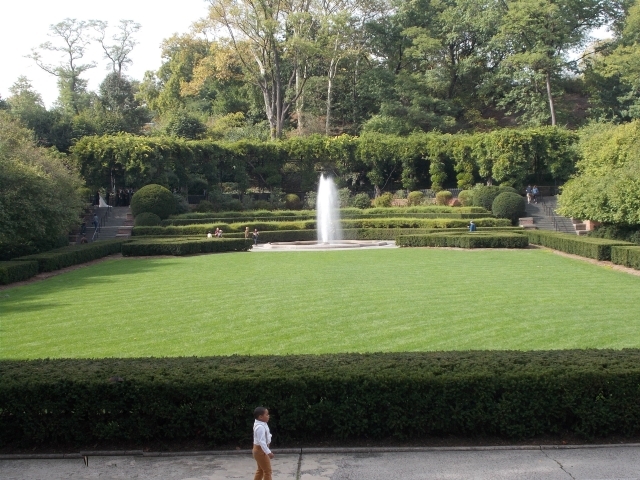 As you may recall from Part I, the Conservatory Garden is divided into three distinct sections. The Grand Italian garden, a sweep of lawn and allees of crabapples that take your breath away as soon as you enter the main gate. A favorite place for weddings. 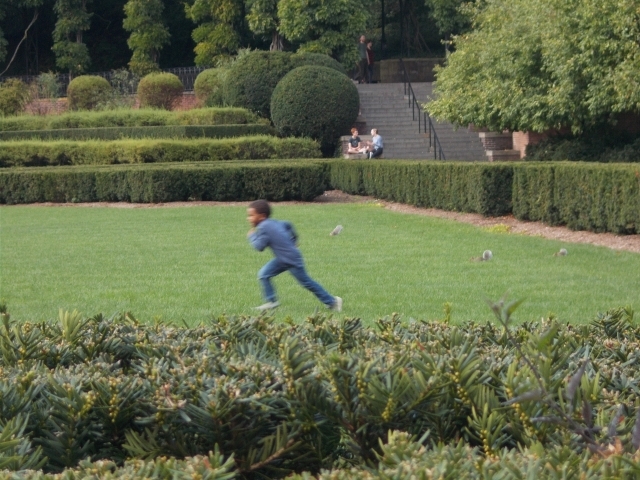 Even kids can have fun on the great lawn. 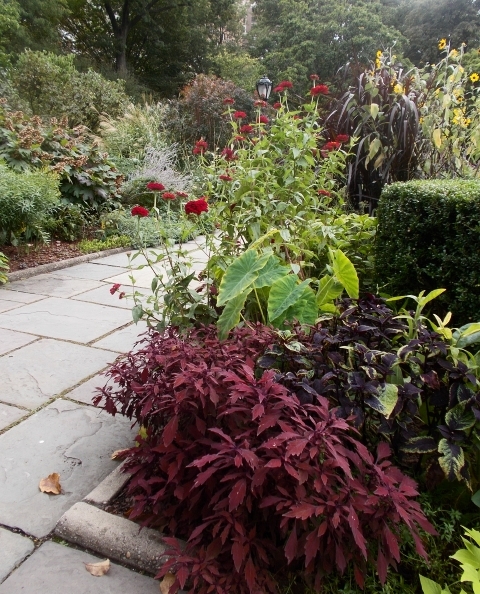 The Romantic English garden that begs us to sit a while and enjoy its magnificent blend of colors and textures folded into shifting patterns of light and shadow. Never boring. 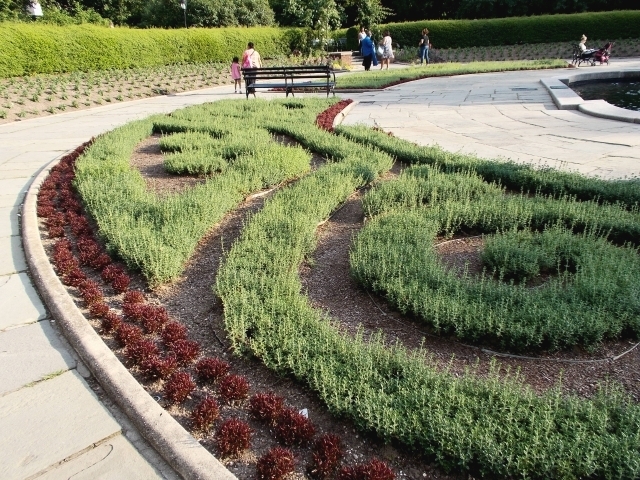 The French Baroque Garden with its formal parterres and intricate plantings that lead your eye around curves and ellipses. Yes, boring when I visited in June. 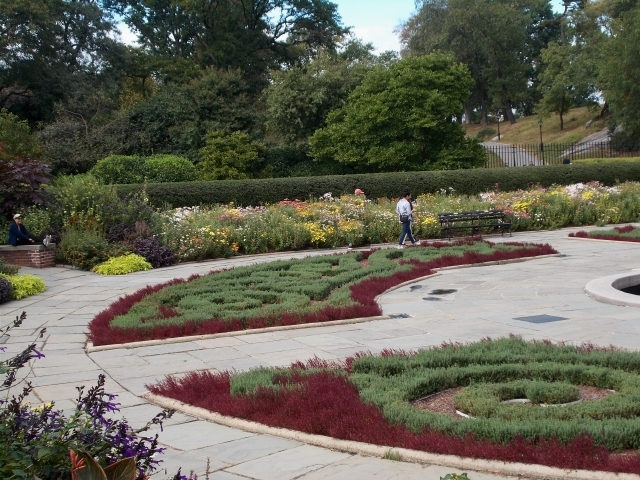 These sculptured beds were impressive, as were scattered beds of lush roses. But most of the periphery was devoted to rows of thousands of transplants, small and insignificant. Strong and healthy, yes, but this was mid-June, high gardening season! When would the garden look finished? Much later I realized that I had missed the May splash of tulips that had bloomed where these small plants now grew. What a show that must have been! When had they been pulled? 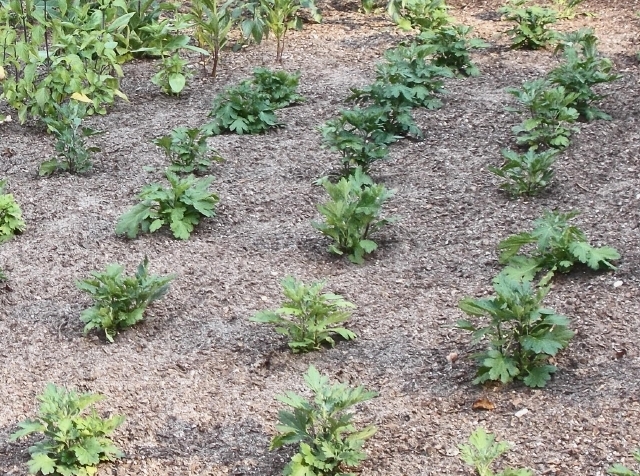 Who had pulled them, and who had planted these thousands of young plants? Gardener though I am, my picture-memories of June remained static, as though time would make no change to this garden. 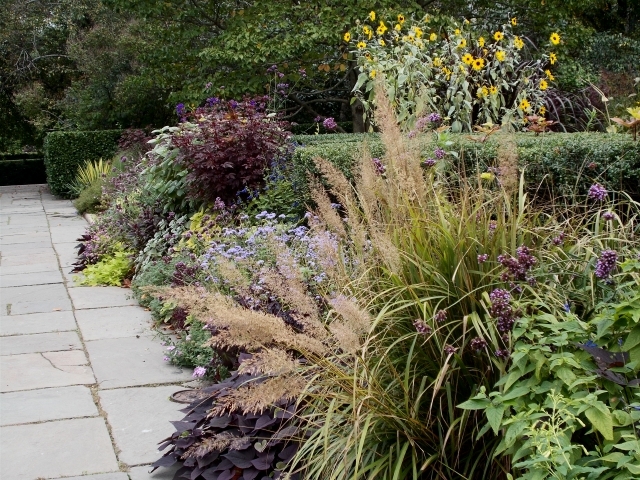 That was why we slated the French garden for an obligatory quick stop in October. I hadn’t counted on those thousands of youngsters around the perimeter growing to maturity during the past three months. 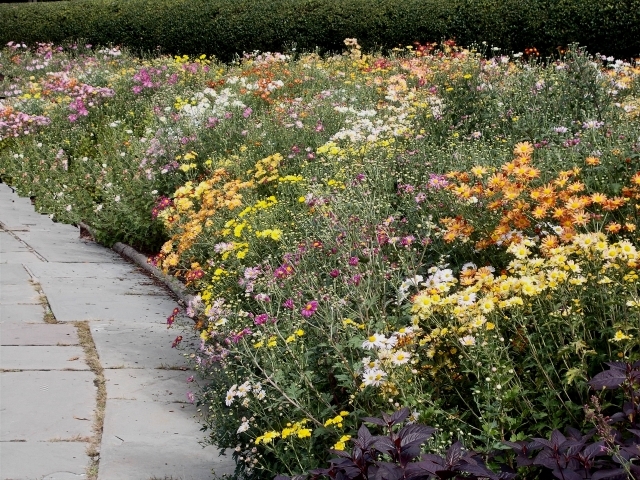 What we saw was a halo of chrysanthemums circling the garden in a haze of color. Not the bold meatball chrysanthemums you buy in pots from nurseries, but relaxed, gracefully arching sprays of blooms in snappy autumn earth tones and subdued pastels. 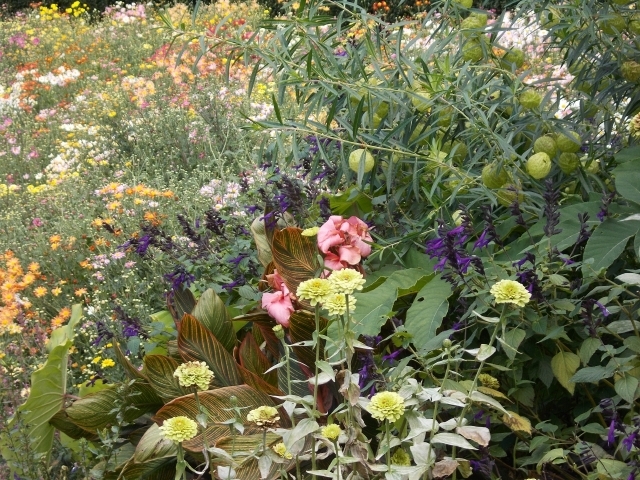 Deep pinks cannas, midnight blue salvia and pale yellow dahlias added to the mix gave the impression of one grand bouquet. We lingered. We couldn’t drink enough of these chrysanthemums. We hated to leave. 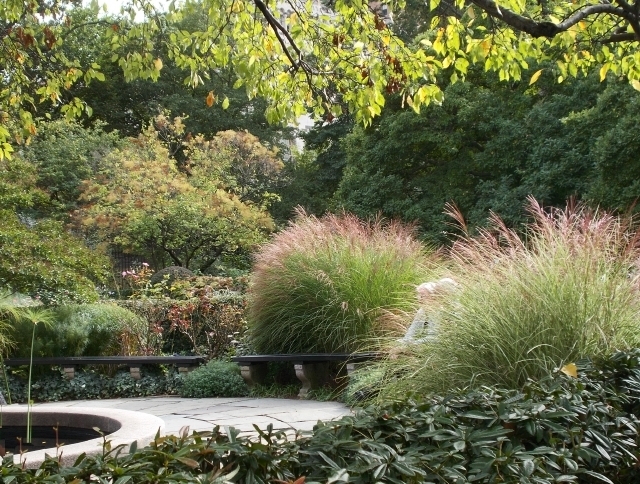 It was a balmy Saturday with teasing glints of sunshine, and New Yorkers were out to savor the delicious autumn gift. 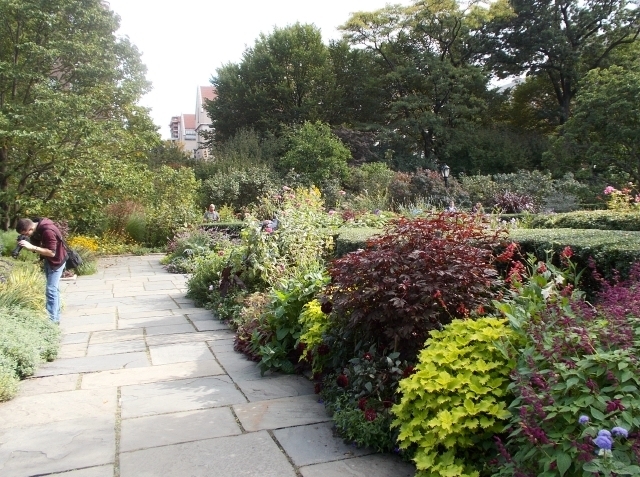 Savor this garden they did, gathering on benches to idle a while, or chat, collecting memories through photographs, or following the path of a vagrant butterfly. 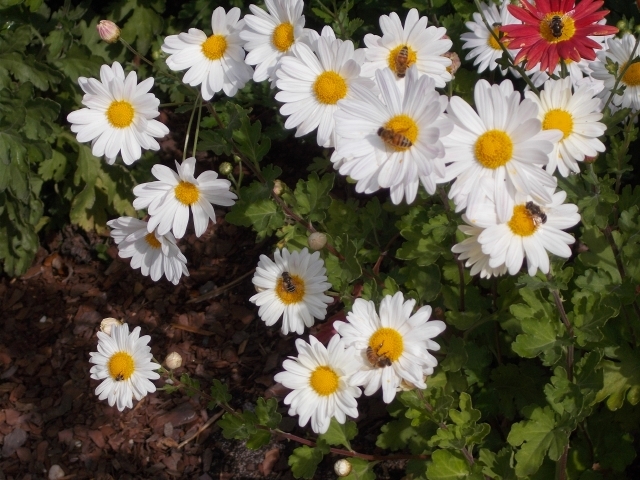 . .
. . .while busy, discreet populations of honeybees worked ripe flowers. 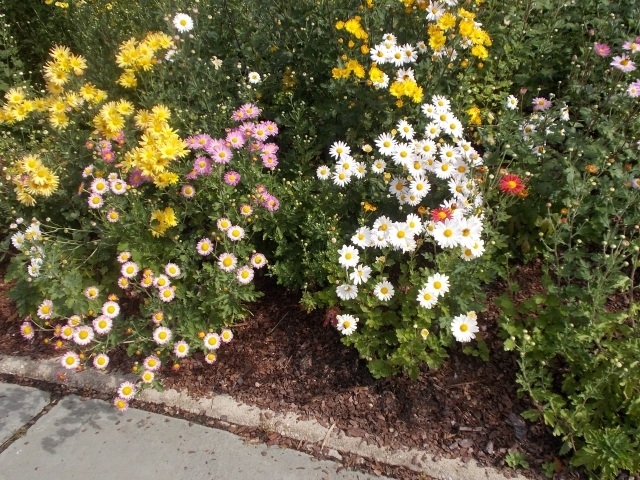 The bees would have good pickins for a while because bloom was in high gear, and healthy ripe buds gleamed in sunshine. We should have checked to see if and how each plant had been cut back to achieve this display. But it was such a fine Saturday. Drinking in sunshine and color was so much more fun than poking around the underwear of chrysanthemums. Here in the South we are encouraged to pinch plants twice before Fourth of July to contain sprawl. That is just around the time when they are budding for an early show, a teaser before autumn hijinx, and most of us hate to lose that tentative bloom. 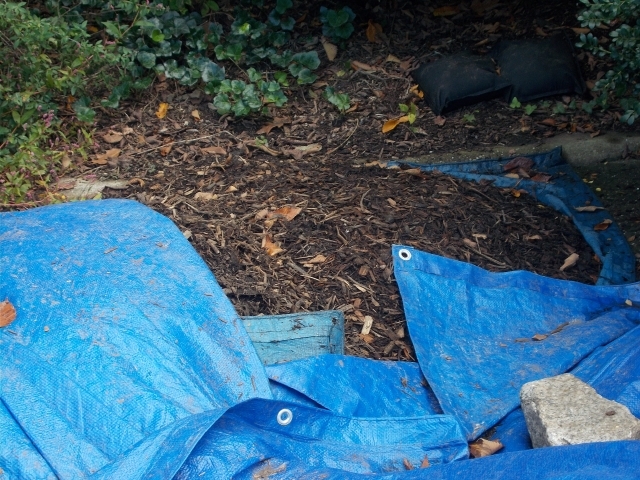 Maybe the plants were doing so well because gardeners used this rich compost liberally, here being stored at the edge of a path between gardens. 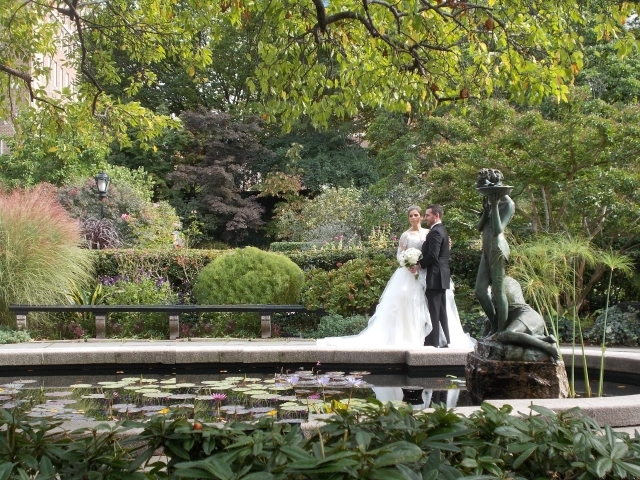 At last, we meandered into the English-style garden to stroll and set a spell, and we were not disappointed. 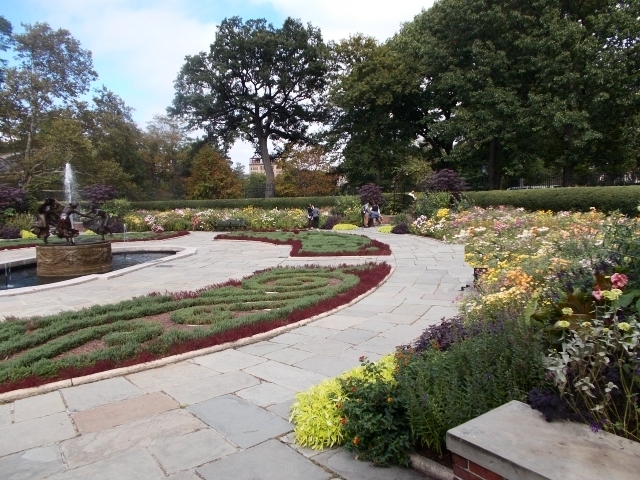 Beds had become even more lavish than in June. 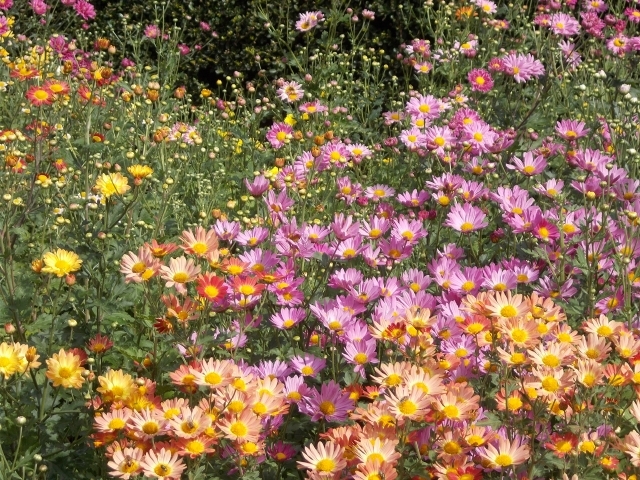 Spring perennials had relinquished sovereignty – after all, it was October — but high-summer bloomers, Russian sage and agastache, and late-blooming sunflowers and asters had boldly taken the reins. 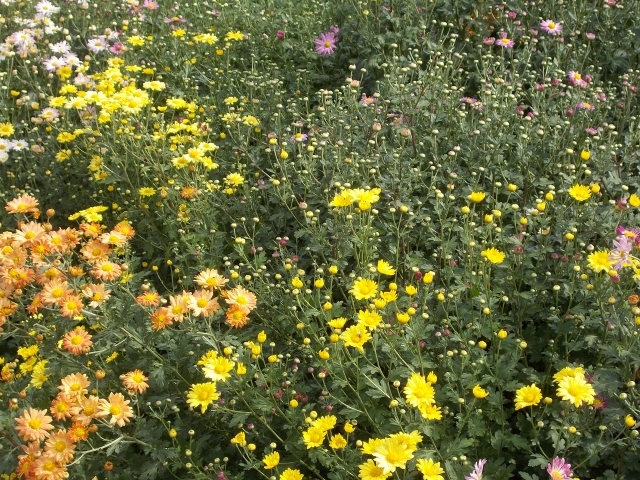 Annuals and grasses were in splendid regalia, dahlias and canna were flirting with us, tugging at us with their come-hither colors and seductive curves, and there was not a square inch of barren soil to be found. 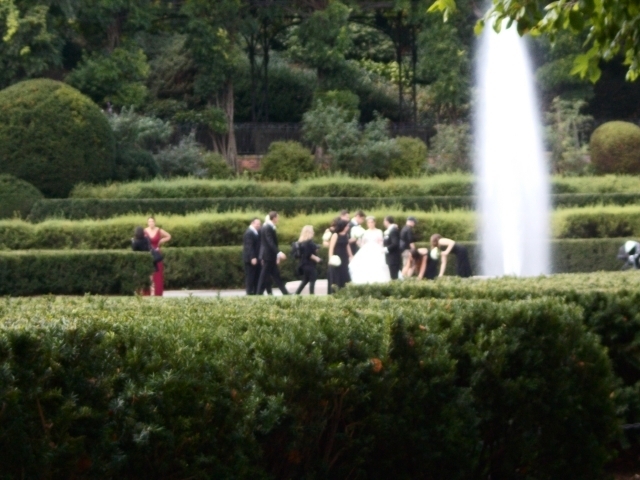 Bridal parties were posing for pictures, a warm and bright October sun caressed the garden, thick foliage muffled city sounds, and all was right and good and at peace in this little corner of the world. I want to return when the tulips bloom.